What is Out of Africa Wildlife Park? Out of Africa Wildlife Park is an opportunity to see hundreds of wild-by-nature animals from all over the world, especially Africa. Not a zoo, not a drive-through park, it’s a place where visitors enjoy an authentic replica of a real African Bush Safari. Besides the entertaining shows and animal presentations throughout the day, all of our animals are cared for with passion and respect, roaming in spacious habitats that give you the chance to see these beautiful creatures and their natural behavior up-close. Our staff lives and works with them in a relaxed environment that encourages human/animal relationships. Out of Africa is more than a preserve. We are dedicated to raising awareness of our exotic neighbors and promoting understanding through in-person contact. 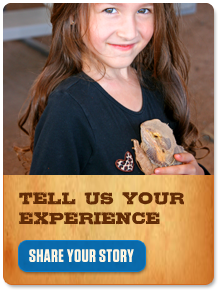 Set against the backdrop of the beautiful Black Hills of Camp Verde, Out of Africa Wildlife Park truly is an awe-inspiring adventure blending family bonds with the power and cunning of the wild, year-round.